Home > Membership > Nonprofit World > How Effective Are Your Human-Resource Practices? 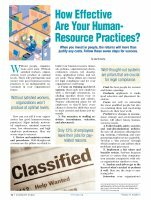 How Effective Are Your Human-Resource Practices? When you invest in people, the returns will more than justify any costs. Follow these seven steps for success.